Working up the courage to take a big, important leap is hard, but Jabari is almost absolutely ready to make a giant splash. Jabari is definitely ready to jump off the diving board. He's finished his swimming lessons and passed his swim test, and he's a great jumper, so he's not scared at all. "Looks easy," says Jabari, watching the other kids take their turns. But when his dad squeezes his hand, Jabari squeezes back. He needs to figure out what kind of special jump to do anyway, and he should probably do some stretches before climbing up onto the diving board. In a sweetly appealing tale of overcoming your fears, newcomer Gaia Cornwall captures a moment between a patient and encouraging father and a determined little boy you can't help but root for. Cornwall captures the exquisite tingle of Jabari's fear and excitement, which gives the book its drama. The visual details -- the way the little sister's tiny hand grips her father's back while her father holds her brother's hand -- give the book its heart. --The New York Times Book Review There are plenty of picture books reassuring kids who don't quite achieve their own goals when they want to (see, for example, Ashley Spires's The Thing Lou Couldn't Do, BCCB 4/17), but here Cornwall celebrates success earned through overcoming fears and through reliance on the supportive presence of a loving parent...Pool season is right around the corner, and this funny and joyful outing will put everyone in the mood for a dip. --Bulletin of the Center for Children's Books (starred review) Mixed-media images in serene muted colors, high-rise buildings above the tree line, and the intriguing addition of faded newsprint accents strengthen the urban feel of the illustrations. Jabari's story will help assuage the fears kids experience when faced with a new and daunting adventure. A terrific seasonal storytime read-aloud that's perfect for one-on-one sharing. --School Library Journal (starred review) In her debut, Cornwall places her loving black family at the center, coloring the swimming pool and park beyond in minty hues and adding whimsy with digitally collaged newspaper for skyscrapers...This simple and sincere tale of working up courage to face fears makes quite a splash. --Kirkus Reviews The dialogue and text are straightforward and make a nice pairing with the creatively chosen angles for the illustrations...a welcome piece for any summertime collection. --Booklist A daunting gaze downward, past Jabari's toes that curl around the edge of the board, makes the water look incredibly far away, and when seen from behind, he seems as high up as the skyscrapers in the distance. It's a lovely, knowing account of a big "first" in a child's life. --Publishers Weekly Against a backdrop of warm brown skin tones and cool aqua water, debut author-illustrator Cornwell presents an empowering and celebratory story. Young readers will root for Jabari as he prepares to take a leap of faith. --The Horn Book Anyone who has hesitated on the brink of something daunting--a brave act or a big decision--will feel a rush of kinship with the small protagonist of Gaia Cornwall's picture book "Jabari Jumps". --The Wall Street Journal Beautifully done. --People It's a summertime rite of passage: jumping off the diving board for the first time. In Jabari Jumps (Candlewick, ages 4-8) Gaia Cornwall brings to vivid life this moment for one little boy...For young listeners, this lovely book is a reminder that the best summers have both challenging surprises and fun. --Buffalo News For a little lightheartedness "Jabari Jumps" (Candlewick, 2017; 15.99) is just the ticket. 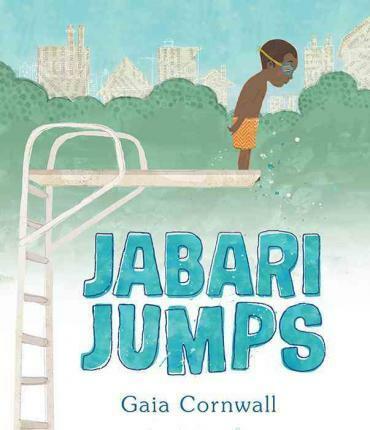 Gaia Cornwall wrote and illustrated this charming story of Jabari who goes to the swimming pool with his father and younger sister and promises that this is the day he will jump off the diving board...Young readers will want to hear or Jabari's challenge again and again.